Oh yeah! CRABCAKE sandwich anyone??! Good food ! Chicken strips, fries , burgers , hot dogs , funnel cakes , ice cream, milk shakes , ....it’s like a mini drive in on the boardwalk. Food comes out as ordered. Fast & friendly service. Tables on the boardwalk.and you get a pretty ocean view. The service was acceptional. The food was pretty good. The atmosphere is good. The Alaska Stand is good for a quick lunch. Ate ice cream as a snack. The location was great - right on the boardwalk. Service was fast and food good. 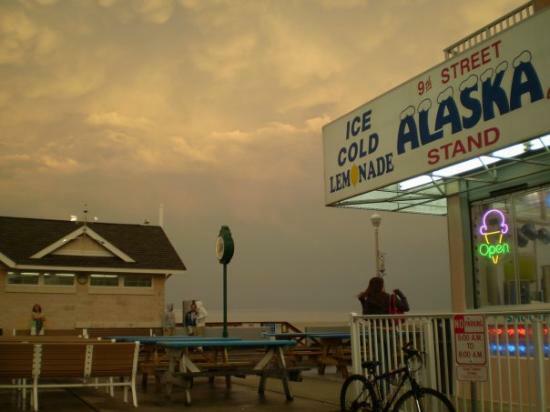 This is my husband's go to place for soft serve ice cream on the boardwalk. His favorite is the chocolate and vanilla swirl. I've gotten a chocolate covered banana there in the past as well that was a good refreshing treat. A tradition for my Family for over 20 years, this place does Not disappoint. Fast counter service, great tasting food, nice picnic table Seating and VERY affordable. This place was very good. Even the guy working gave a a burger wrapped in lettuce because i can't have bread. It was wonderful. Get quick answers from Alaska Stand staff and past visitors.